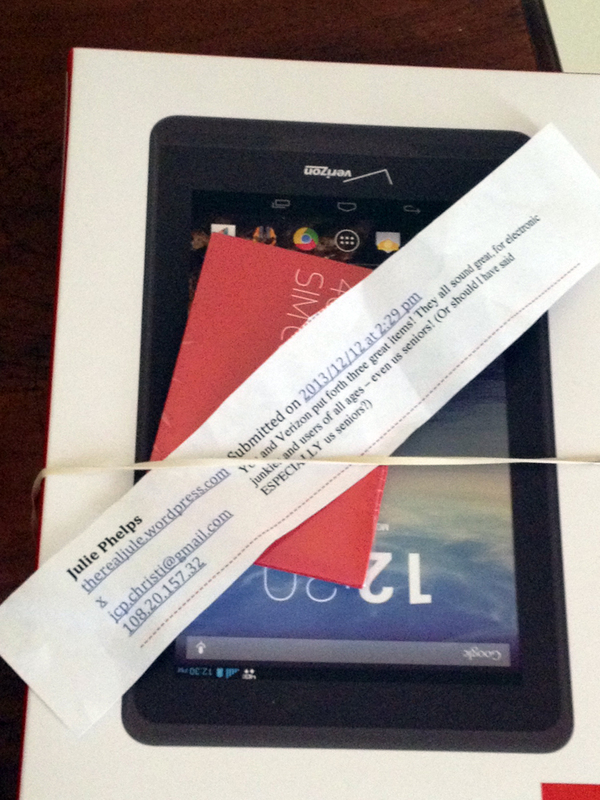 Julie, your tablet is on its way to you, along with a SIM card and a few other goodies from Verizon Wireless and me. Not sure it will reach you before Christmas, since there’s a lot of traffic out there what with Santa’s reindeer and his massive fleet of UPS trucks. Nevertheless, you and Patricia Craven (winner of the Mophie Juice Pack Power Station) and Shawna Elkins (winner of the Mini Jambox by JawBone), definitely have something wonderful in store. My heartfelt thanks to all of you who entered the drawing through the blog, the Midlife Second Wife’s Facebook page, and on Twitter. 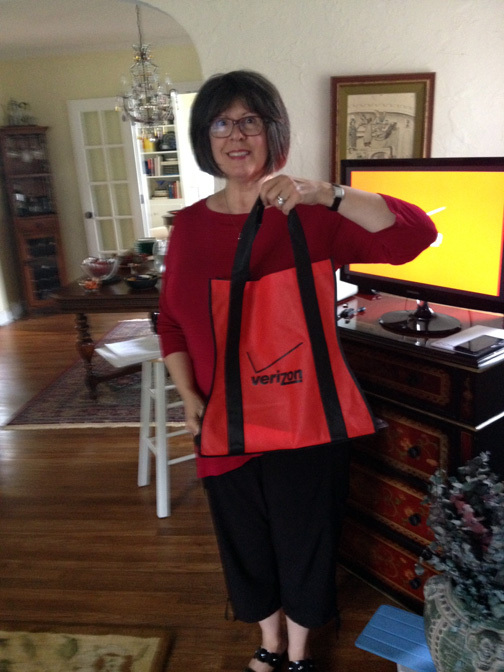 And a special thanks to Verizon Wireless for being such a phenomenal brand partner for the last six months. My time with them is drawing to a close, but I’ll be back here in a week or so with some closing thoughts on the experience. For season’s greetings to fine blogger friends. Broke ground along Midlife Boulevard. On bandwidth they ply their acumen. I bestow a day off with Bueller, Ferris. Oh, the places they’ll go! The things they will see! As they ride alongside that blonde, Shelley Z. Are Vikki Claflin and Jessica Bern. Let’s all end the night at a fun discotheque! So let’s give some plane tickets to Karen Austin. With Laurel Regan and Sandra Sallin. Are Lisa Carpenter and Andy Garcia. So as not to disturb your aperitif. Far be it from me to annoy and to pester. I’ll just go sit by my friend Cathy Chester. For Princess Rosebud and Judy Rothman Rofé. Seashells for one, madeleines for the other. For Risa Nye, a song sung by Usher. What shall we buy Evelyn Kalinosky? May Evelyn never encounter distress. But instead whirl around in a Furstenberg dress! Produced by our own Kim Jorgensen Gane. Before there is acting there must be the word. Actors are not just seen, they must also be heard. I’ve ordered a snuggle from Eddie Redmayne. That she’ll not find herself Waiting for Guffman. Travelin’ to do with Mindy Klapper Trotta. Come along, Rosalind Warren and Helene Cohen Bludman! For Felice Shapiro and Shelley Emling. For Ellen Dolgen, great closets of shoes. For Julie Phelps and Mary Dell Harrington. Heffernan, Flowers, and Froman—we’ll order you pizzas! for our idol, Lois Alter Mark. So to her a gold Rolex—oh golly! Oh wow! Darryle Pollack and Lynn Forbes—they’re here! Hard to carry around, but hey, what the hay? YOLO, you know? Or so they say. We’ve booked passage on a Viking River Cruise. An exquisitely jeweled ruby tiara. A grand yacht apiece, complete with life rafts. I wish joy in her new-found work-and-life balance. I send you glad tidings and eggnog and cheer! The poetic lapse in my narrative. So I’ll see you back here midst the red and the green. Peace, love, and joy on your own boulevard. 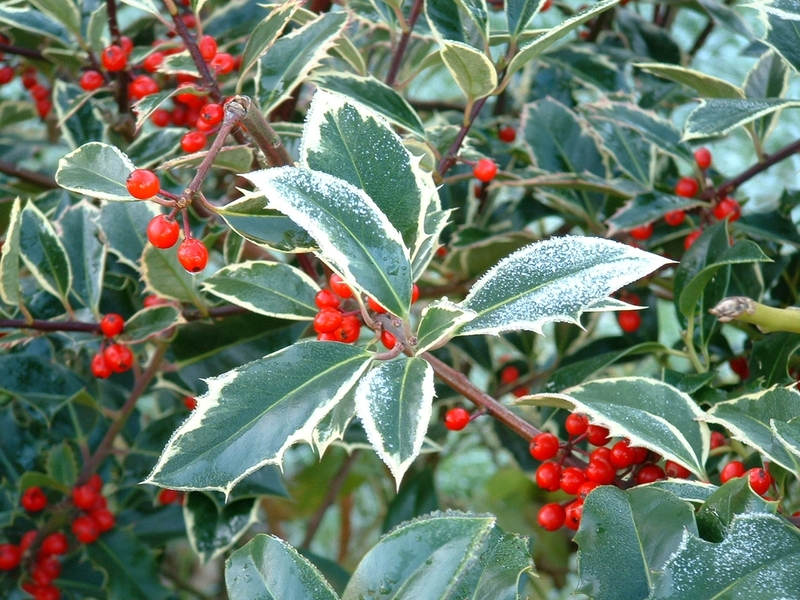 To read the holiday poem from 2012, click here. 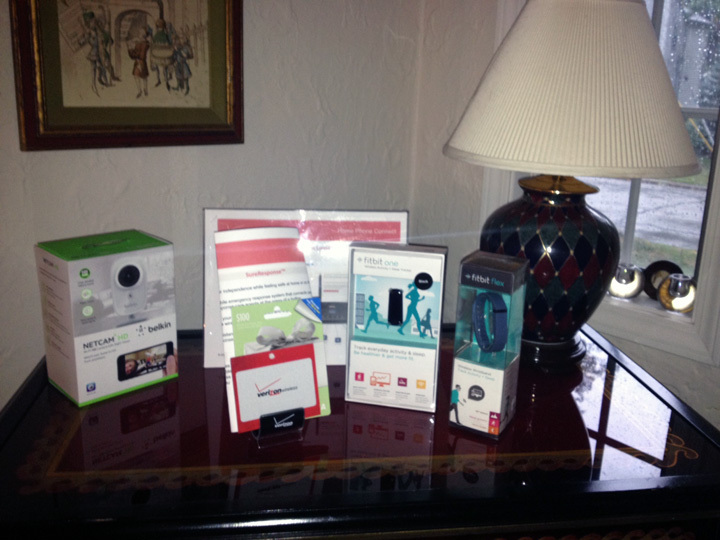 Posted by themidlifesecondwife in Product Reviews, Special Events, Technology, What's the Buzz? Voilà! 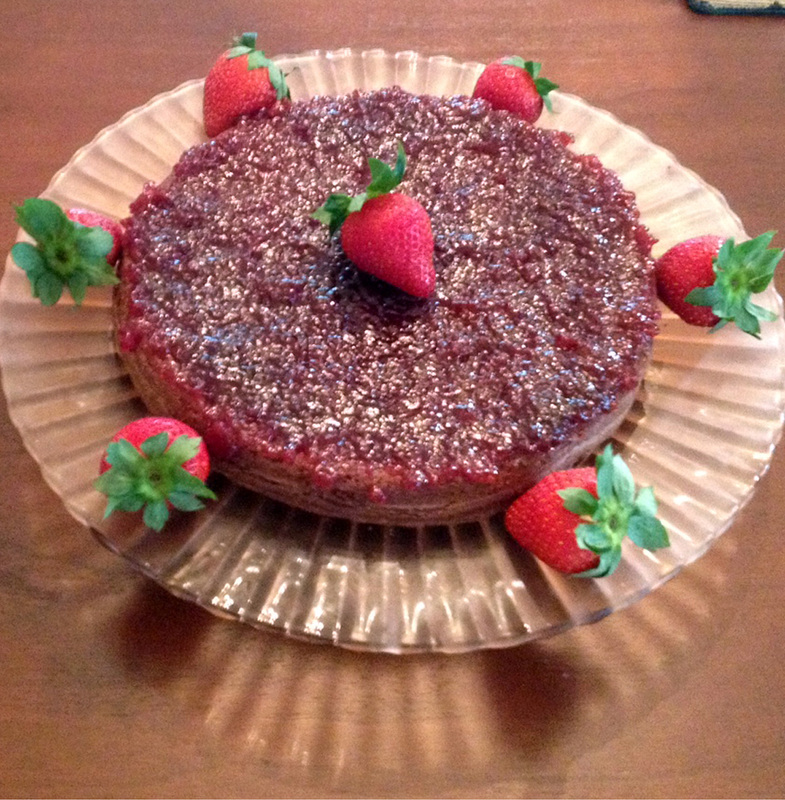 I frosted this with strawberry jam and garnished it accordingly. As a reader of this blog, this is your consolation prize: the chance to peer through the looking glass of your screen and glimpse a few highlights from the party. You’re never far from my thoughts, dear readers. Come along and enjoy! …in hopes that Verizon soon would be there. 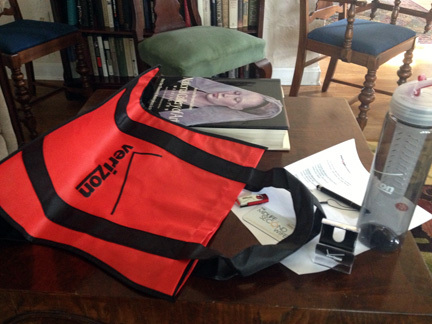 Look at the great swag nestled in those black and red bags: A water bottle (complete with a nifty ice holder); a phone holder; a stylus that doubles as a pen; a flash drive stocked with detailed information on the devices demonstrated at the party; a list of nearby Verizon Wireless stores and, to go with it, a $50 coupon redeemable with purchase at one of those stores. And check out the buffet table! 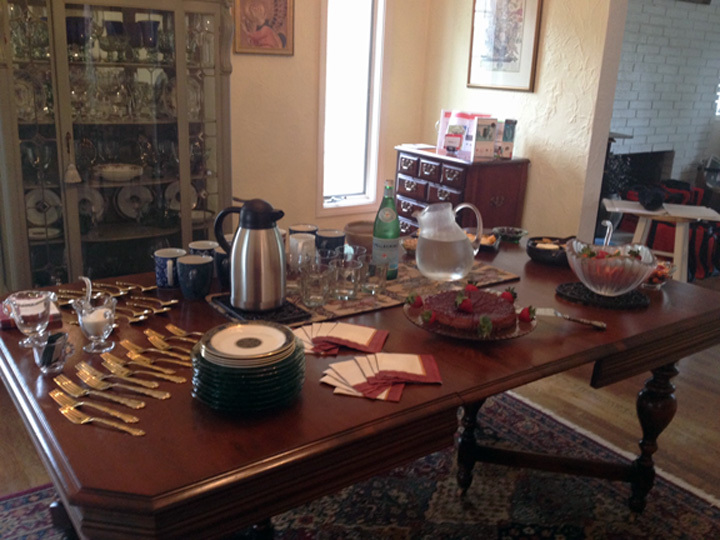 In addition to the chocolate tea cake, I served fresh strawberries, an array of cheeses (and crackers), assorted nuts, and a few decadent sweets from Trader Joe’s. 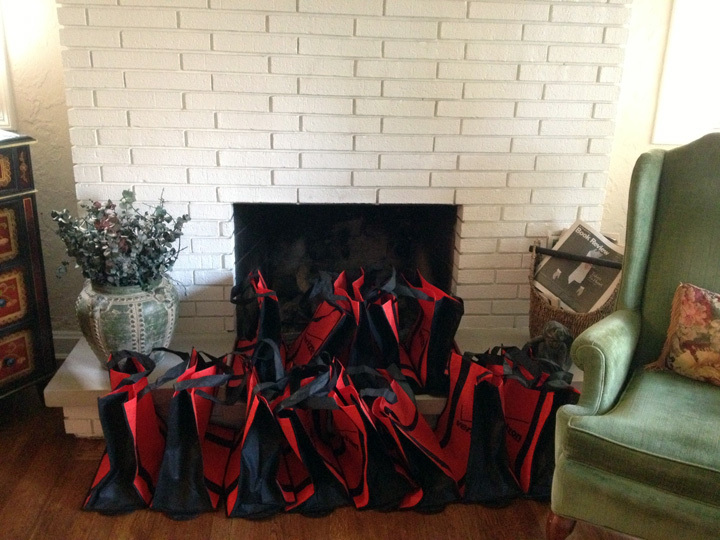 These are some of the prizes that were up for grabs: To keep things moving along, I held a few old-fashioned drawings. But my guests really loved playing “Whad’ya Know About Verizon Wireless?” They wrote their names on index cards upon their arrival, and I drew two cards for each round of play. 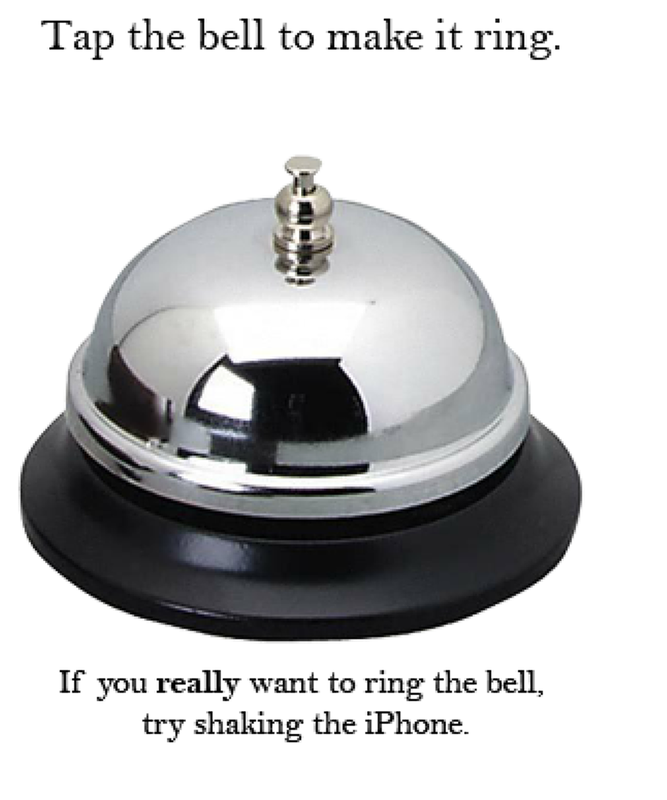 I had already downloaded two service bell apps—one for my iPhone and on for the DROID RAZR MAXX HD I’ve been testing for the program. Whoever rang the bell first got to answer the first question (there were five questions in each round). c) Can You Hear Me Now? IV. TRUE OR FALSE: The iconic spokesperson for Verizon Wireless, featured in the “Can you hear me now?” commercials, had blond hair and wore a long-sleeved blue shirt. Here are some pictures of my guests. Oh, Verizon? 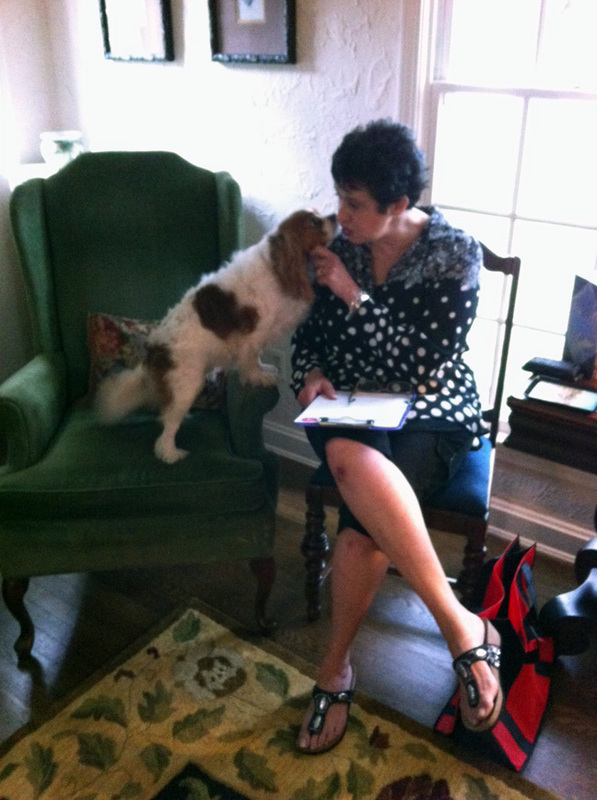 If you need a mascot may I suggest our Cavalier King Charles Spaniel Sandy? I hope you’ve enjoyed my virtual party! So long for now! Posted by themidlifesecondwife in Love, Midpoints, Remarriage, Transitions, What's the Buzz? What do we talk about when we talk about love? I recently had the honor to participate, via Google Hangout, in a lively panel discussion on the WHOA! Network. I loved talking with these accomplished, thoughtful, and insanely fun women about what it really means to find love at 50-plus. We talked about the lessons of our past relationships. We talked about the exhilaration of discovering that one amazing person who is perfect for us—and our surprise in realizing that person happens not to possess some of the qualities and life experiences we’ve toted around on our preconceived checklist of “must-haves.” We talked about the courage it takes to make a commitment, to upend our lives in order to start a new one with THE ONE. 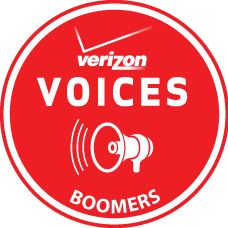 Now hear this: Verizon is partnering with a select group of midlife bloggers across middle America as part of a new program called “Verizon Boomer Voices,” and they chose yours truly to lend her voice to the chorus. This an important step in the right direction—for boomers and for Verizon. And yet, despite our obvious value, boomers have been largely invisible to advertisers and television programming executives. A segment on HuffPost Live last year, “Over 50, Under Counted,” focused on this oversight. One of my very smart boomer blogger friends, Darryle Pollack (in a previous life Darryle was a television reporter), contributed wisely to the conversation. And it delighted me to see that a comment I sent in during the segment’s live stream received attention by the moderators, even if the impossibly young woman did mispronounce my name as Marc. I. Rich. With Verizon’s program, it appears as though at least one mega-brand recognizes that it’s good business to pay attention to our colossal clout. Verizon is flying me to Chicago this weekend for some training on the device I’ll be testing. In return, I’ll post about the device once each month through December, and I’ll augment those posts with tweets and Facebook updates. One could nickname this program “posting and hosting,” since I’ll also host two house parties where I’ll invite friends, family, and neighbors to eat good food and check out the Verizon goods. I’ll also have to attend monthly webinars, so you can see that this endeavor will keep me busy. It goes almost without saying that I’m thrilled they chose me for this program, and not just because of the perks. (One of my favorite lines from All About Eve is when Bette Davis says, “I’m … not to be had for the price of a cocktail, like a salted peanut.”) What Verizon is paying for is my honest opinion, and that’s what they will get. If you’ve read the product review I wrote for Viewpoints on a kitchen appliance, you know that I play it as it lays. I think it’s great that Verizon cares what boomers have to say about the products we buy in the marketplace, and that we use as an integral extension of our daily lives. I should note that I’ve been a loyal Apple consumer ever since my first desktop back in the 1980s, so if I’m to be playing around with non-Apple devices, doing so will mark a first in my own consumer history (except for the Kindle I received from my husband as a Christmas gift). I don’t count the Kindle Paperwhite that I reviewed for Viewpoints, since I donated that to the Richmond Public Library. Suffice to say that if I encounter any cumbersome learning curves, I’ll try to make reading about them enjoyable for you. So let’s all raise a glass (and a salted peanut) to Verizon for thinking that the opinions of boomers have value. And for being willing to listen. Updated on June 22, 2013. So much has happened in two short, swift years. We moved to another part of the country and set down roots by buying a home. (I also started this blog, which celebrates its first anniversary later this month.) We continue to grow together and learn together and hold each other close when buffeted by life’s vicissitudes. We embrace one another’s neuroses. (Thank you, Wendy Swallow.) We celebrate every triumph, no matter how small. We listen to each other. We support one another. We are a duo, a couple, a unit, a team. We are each other’s best friend. We are nothing if not brave. What else can we be? We are human and we live in this world and we have faith. And we are together, thank God. 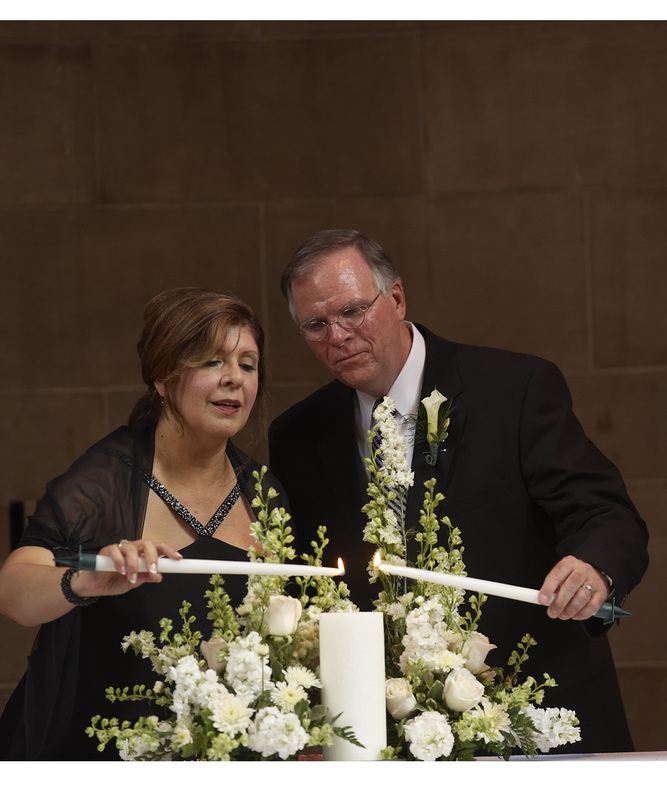 On what will be our second wedding anniversary—and on every day of our lives together—I say to “arts&sportslvr:” Thank you for joining your candle to mine, and mine to yours. Ouch. Thanks, Rosanne. Thanks, Matt. No, really—thanks. Because this got me thinking—always a good exercise when writing a blog. Many of us in our 50s and 60s don’t feel old. Do we? And if we’re careful and follow all of the good advice out there, Thornhill reminds us that thanks to the miracle of modern medicine and technologies, the new normal is such that we could very well live—and live well—into our 80s and beyond. And if such is the case, we’ve got a good 20 to 30 years to fill. It’s nice to have the extra time. But what are we going to do with it? Thornhill writes that he and his colleagues at the Boomer Project “believe that boomers are going to fulfill their ‘promise’ as a generation by individually living out their own personal promise or agenda.” You might recall that ours is the generation that intended to change the status quo in the 1960s. Thornhill quotes Tom Brokaw, who famously chronicled our generational predecessors in The Greatest Generation. Apparently Brokaw thinks that we baby boomers squandered our opportunity to make a lasting, positive difference in the world. I’m happy to read that Thornhill disagrees with Brokaw’s assessment. And here’s where we can take up the challenge. If you believe, as Thornhill does, that we still have the opportunity, in the next 20 years, to apply “our collective wisdom and experience from our ever-increasing trips around the sun, [then] our legacy as a generation is in front of us.” We can effect positive change on “companies, organizations, governments, each other and other generations,” as long as we “live our promise.” And Thornhill believes that it is our personal promises, as boomers, that will make the difference; he predicts that most of them will be outwardly focused. Did we, as a generation, blow our chance to leave a lasting and positive legacy? Or is the best, as Frank Sinatra sang, yet to come?